Higher concentrations of Arsenic in drinking water have hazardous effects on the human body. Some of these harmful effects including cardiovascular diseases, skin cancers, skin lesions, neurodevelopmental delays and whatnot. It can prove to be lethal if a very high amount of the metal contaminates the drinking water. Pakistan’s situation is extremely alarming – more than 60 million people are exposed to arsenic-rich contaminated water. Earlier a study published by Pakistan Council for Research in Water Resources (PCRWR) said that 72% of water supply schemes in the country are functional and 84% of those had supplied water that was not fit for consumption. According to the map produced by Science Mag, the majority of Punjab, particularly Southern Punjab, is exposed to unhealthy water. Sindh also suffers from the same issue all along the Indus river. The recommended limit for Arsenic is 10 micrograms per litres of water, as per the World Health Organization. The regulatory body had warned in 2014 that 200 million people have access to contaminated water, most of them from Bangladesh, India, Vietnam, and Nepal. Previous studies carried out in Pakistan revealed high levels of the metal in groundwater however, its extent was unknown. The author of the study, Joel Podgorski’s team collected 1200 samples (3-70-meter-deep wells) from all over Pakistan and the spatial processing performed on the data revealed shocking results. Experts hope that the Pakistani authorities will take action to reduce the risks of this health hazard. Richard Johnston, a public health engineer at WHO says, “It’s a reminder that arsenic remains a serious public health threat in drinking water”. Charles Harvey, a hydrogeologist at MIT says, ““People should be aware that water in their well has high amount of arsenic”. “Maps like this have a big impact”. 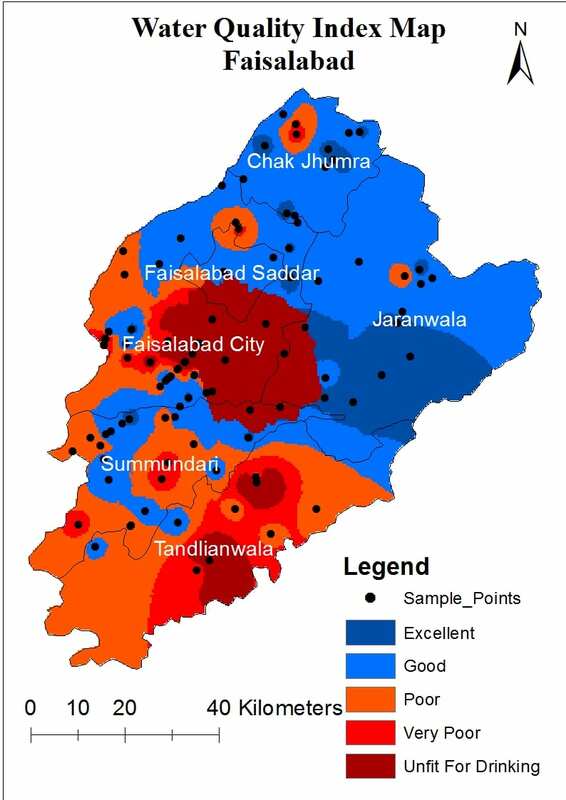 Another recent study done by the students from National University of Sciences and Technology showed the overall Water Quality Index of Faisalabad district. This map clearly depicts how bad the situation is in Faisalabad. 50 data samples, which were provided by PCRWR, were used for this study. Geospatial interpolation produced these results, which is quite alarming. Kindly add complete map of Pakistan. Kashmir is totally missing in this map. So this is the whole issue in this post? hahaha…people dying on arsenic doesn’t matter but kashmir should be on the map shown on propk. Stupidity at best! I’ve seen government filters in Lahore having monthly/ quarterly analysis reports before/after purification. The numbers were cool. I hope government installs more filter plants throughout the city and LDA should make compulsory for private housing schemes to install filter plants on emergency basis. I met an accountant who works at Gourmet a few months ago. He said they change their filters for their bottled water service every 90 days in Lahore and other cities, and every 40 days in Faisalabad. It’s not just arsenic that’s polluting the water there. hum to LARKANA ke Arsenic water se pale hain bachpan se. No issues of charya-pana at all there.. :) Mithho paani khappay.